Lieutenant Colonel Monzurul Hassan Khan, a commanding officer of the Border Guards Bangladesh (BGB), speaks as Rohingya refugees stand outside their temporary shelters at no man's land between Bangladesh-Myanmar border, in Cox's Bazar, Bangladesh September 9, 2017. COX‘S BAZAR, Bangladesh - Until late last month, Syed Karim grew rice and sugarcane on a strip of unclaimed land along the international border where Myanmar ends and Bangladesh begins. On Aug. 25, the 26-year-old Rohingya Muslim man abandoned his home in a nearby Myanmar village and moved to the no-man’s land, fleeing a crackdown by the military against his community in response to militant attacks. An estimated 370,000 Rohingya have fled to Bangladesh since that day. But Karim and thousands of his neighbors from Rohingya villages near the border face a unique predicament. They have fled to the safety of the buffer zone along the border and are now stuck. Bangladesh security forces have instructions to not let them in, said Monzurul Hassan Khan, a Bangladesh border guard officer. Some of the Rohingya there said they are too afraid to go back to their homes but not ready to abandon them altogether and become refugees in Bangladesh. “I can see my house but can’t go there,” said Karim, whose Taung Pyo Let Yar village could be seen from his shack in the no-man’s land. The top U.N. human rights official has called Myanmar’s operations against the Rohingya as “a textbook example of ethnic cleansing” and the Security Council is to meet behind closed doors on Wednesday to discuss the situation. The 40-acre (16.2-hectare) buffer zone, about the size of 40 soccer pitches, is strung along the border, with a barbed wire fence on the Myanmar side and a creek on the other. Hundreds of tarpaulin bamboo shacks have come up on what used to be a paddy field, with hills in the south. Khan said 8,000 to 10,000 Rohingya had camped there. The UN refugee agency, which runs camps in Bangladesh, doesn’t go there because of security reasons, said Vivian Tan, a spokeswoman for UNHCR. Tan said that they work with some NGOs to provide people in the area with plastic sheets and clothing. Myanmar has laid landmines on its side of the border, which have wounded at least four people, Bangladesh authorities and Rohingya refugees said. Buddhist-majority Myanmar says its security forces are fighting a legitimate campaign against “terrorists” it blames for the attacks on the security forces. 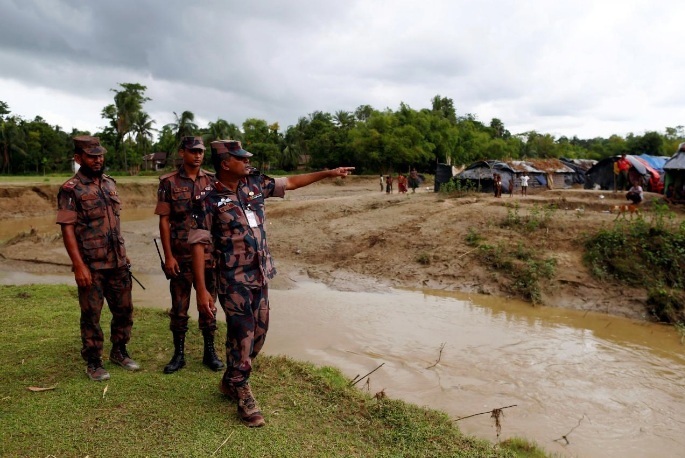 Several Bangladesh officials said they suspected that about 100 fighters from the Arakan Rohingya Salvation Army (ARSA), the insurgents who attacked Myanmar police posts and an army base on Aug. 25, have also been spotted in the border area. Bangladeshi security officials said they learned from informers that suspected ARSA fighters were in the area early last week, after the Eid al-Adha festival. The officials, who requested anonymity because of the sensitivity of the situation, said 11 suspected fighters were also being treated in a hospital in Chittagong city, north of Cox’s Bazar, which is close to the border. An ARSA spokesman denied that any of its fighters were using the no-man’s land to launch attacks and said none of its fighters were in Bangladesh. Mostafa Kamal Uddin, Bangladesh’s home secretary, said he did not have information about the presence of Rohingya militants in Bangladesh. Karim and other Rohingya people, mostly from the border villages, said they started fleeing to the buffer zone after the Aug. 25 attacks. Khan, the border guard officer, said their numbers swelled on Aug. 27. “We kept hearing gunshots and also saw a fire and smoke on their side of the border,” Khan said. He pointed to two brown patches of burned trees in Taung Pyo Let Yar village from his operations base on a hilltop in Bangladesh’s Gundum village near the border. His men with automatic rifles kept watch as Rohingya children waded across the creek to fetch fresh water in aluminum pots and plastic bottles from a hand-pump on Bangladeshi soil. A toddler, with the knee-deep waters rising to his neck, struggled with three plastic bottles, dropping one before turning around and picking it up and pressing forward. In interviews at the buffer zone, where Reuters was taken by Khan, residents of three villages - Taung Pyo Let Yar, Mee Taik and Kun Thee Pin – said they were spared in the previous big military crackdown in October last year. But things changed on Aug. 25. Mohammed Arif, a Rohingya man from Taung Pyo Let Yar village, said he fled into the woods near the village to hide when the army came. From there, he watched a mortar shell hit his two-storey house, burning it down. He crossed over the fence on Aug. 26 with his family. Arif said he had not seen any ARSA fighters in the no-man’s land. “In our country, Buddha worshippers treat us like a virus that needs to be eliminated. We have heard them saying, ‘No Rohingya in Myanmar.’ But we will go back,” Arif said. Until late last month, Syed Karim grew rice and sugarcane on a strip of unclaimed land along the international border where Myanmar ends and Bangladesh begins.